Without a plan B, it seems likely all this month’s grim jobs stats and record bad figures are likely to be replaced by new ones, writes the TUC’s Richard Exell. For anyone who came of age in the 1980s, today’s labour market statistics will have brought back their youth: a big jump in unemployment (with records for women and young people); redundancies going up; vacancies down; and the highest level of involuntary part-time employment since records began. In the first half of the year, many of us wondered why the employment and unemployment figures were reasonably good, when the GDP figures were dreadful. • In May-July, there were 29.169 million people in employment. This was 69,000 lower than in April-June; normally a fall like this would only happen during a recession. The current data series goes back to 1992, and there have only been two periods that saw bigger falls: the early 90s recession and the 2008-9 recession. • Unemployment rose over the 2½ million mark again, to 2,510,000. The 80,000 increase is also high – the highest since the period between the summer of 2008 and the summer of 2009, when the number out of work grew by three quarters of a million. There were 973,000 unemployed 16-24 year olds. This gives a youth unemployment rate of 20.8 per cent, the highest since 1992. – The number of 16 and 17 year old men in employment (150,000) is also the lowest since 1992. – 19.8 per cent of 16-17 year old men are in employment, the lowest rate since 1992. • There were 3,345,000 18-24 year olds in employment, the lowest level since 2001. • The 18-24 employment rate (57.3 per cent) is the lowest since 1992. • There were 769,000 unemployed 18-24 year olds – the highest since Mar-May 1993. • The 18-24 unemployment rate (18.7 per cent) is the highest since 1992. – And the 18-24 unemployment rate for women (16.6 per cent) is also the highest since 1992. • The number of unemployed 18-24 year olds rose 77,000 – in the past 19 years the quarter-on-quarter increase has only been higher once, in Mar-May 2009. Eight hundred and forty nine thousand people have been unemployed for more than 12 months, the highest level since the beginning of 1997, and 415,000 have been unemployed for more than 24 months, the highest since the summer of that year. Two hundred and ninety five thousand women have been unemployed more than 12 months, the highest level since Sep-Nov 1994 and 120,000 for more than 24 months, the highest since 1996. The claimant count measure of unemployment rose again, to 1,576,835. There are 534,494 women on the claimant count, the highest level since August 1996; 33.9 per cent of the unemployed people on the claimant count are women, the highest proportion in the current series, which began in 1983. Other indicators of labour market weakness are also worrying. There were 1,284,000 people working in part-time jobs because they couldn’t find full-time work, the highest figure since 1992; 16.7 per cent of part-time workers (one in six) were involuntary, also the highest figure since 1992. The 583,000 men and 701,000 women in involuntary part-time work are the highest figures since 1992; 29.8 per cent of men’s and 12.2 per cent of women’s part-time jobs were involuntary, the highest proportions since 1993. There are 2,348,000 people who were economically inactive who said they wanted jobs, an increase of 55,000 – the highest quarter-on-quarter increase since Aug-Oct 2002, and the 49,000 increase in the number of women who say this (to 1,347,000) is the largest increase since 1992. There were 162,000 redundancies in May-July, an increase of 47,000 on the previous quarter, the biggest increase since early 2009. 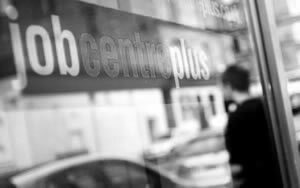 There were 452,000 job vacancies, with 5.6 unemployed people for each vacancy; these are the highest figures since Sep-Nov 2009. In such a welter of bad news it can be hard to pick out a theme, but one indicator suggests a grim future, and that is what is happening to public sector jobs. Private sector employment is growing, and if it had maintained the level of growth seen last year there might have been some hope that it would compensate for the loss of public sector jobs, as Chart 1 shows. Austerity and the global slowdown are now crimping private sector job creation; in the last quarter, net job creation there slipped to 41,000. But public sector cuts are now gaining momentum, with 111,000 jobs lost in the last quarter and probably more to come, as Chart 2 shows. It now looks very likely the Office for Budget Responsibility’s March forecast (pdf), that unemployment would peak at 8.2 per cent, was over-optimistic; their other unemployment forecast, that the claimant count would peak at 1.54 million, has already been overtaken. Without a plan B, it seems likely all this month’s entries in the record books are due to be replaced by new ones. RT @TheRightArticle: Without a Plan B, the record unemployment figures look set to get worse – http://t.co/MDR0x5ko < "Price worth paying"?